Humans play a leading role in the spread of invasive species. From accidental introductions, like Japanese stiltgrass (Microstegium vimineum), to intentional planting, like tree of heaven (Ailanthus altissima) and mimosa (Albizia julibrissin), we have done an exceptional job of transporting invaders all over the world. Our cars carry seeds and propagules along highways, our boats drag invasive aquatic vegetation between watersheds, and our boots transfer seeds across the planet. However, although we are major culprits in the spread of invasive species, we aren’t alone! White-tailed deer are spreading invasive species throughout the U.S. Photo taken by Betty Truax. Studies increasingly suggest that the rapid spread of invasive species throughout forest understories is attributed to white-tailed deer. White-tailed deer are a double-edged sword because they can both directly and indirectly spread invasive species. Deer directly spread exotic species when they consume their seeds while browsing and then deposit those seeds elsewhere via piles of droppings. And although those seeds have passed through the deer’s gut, some are viable and can germinate. 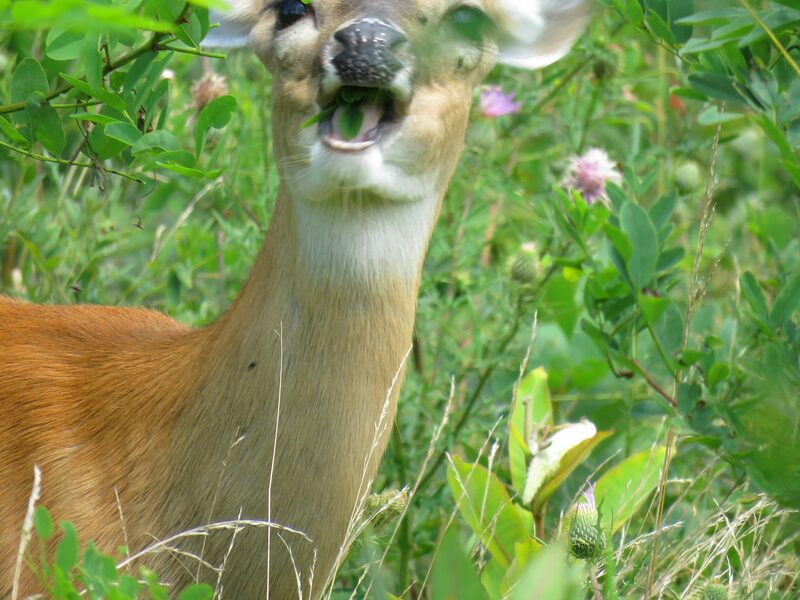 One study showed that deer in Connecticut carried 40 species of plants not native to the United States! White-tailed deer can also directly spread species such as Japanese stiltgrass when seeds are picked up in their hooves and carried elsewhere. White-tailed deer indirectly benefit invaders by creating disturbance within the landscape. Usually when we describe disturbance, we use examples such as flooding, fires, storm events, and human construction. Disturbance usually results in damaged plant populations, which clears space and opens the door for invasive species to quickly establish and outcompete its native counterparts. And although white-tailed deer are not starting forest fires or flooding anything, their patterns of grazing and trampling can cause small-scale disturbance. Rural Pennsylvania is the perfect place of study for this phenomenon. Trillium flowers are known to cover the forest floors by the thousands there, but in recent years those populations have declined sharply in numbers. Concurrently, garlic mustard (Alliaria petiolata) populations have exploded. Invasive species, including garlic mustard, often have difficulty establishing in mature forest understories and under certain conditions native flora (like trilliums) can even outcompete garlic mustard! However, the disturbance created when deer graze is enough to allow the garlic mustard to establish and spread. White-tailed deer preferentially consume native flora, and are especially fond of trillium. As deer progress through the forest, they remove the trillium and leave the uneaten garlic mustard behind. This creates plenty of opportunity and space for the garlic mustard to establish, spread, and take over. To make matters worse, the simple act of trampling plants as they walk disrupts the soils and gives garlic mustard an even greater leg up in the battle for establishment. Thankfully, some studies show that excluding deer from forests allows the native plants to regain their competitive edge (Kalisz et al. 2014). 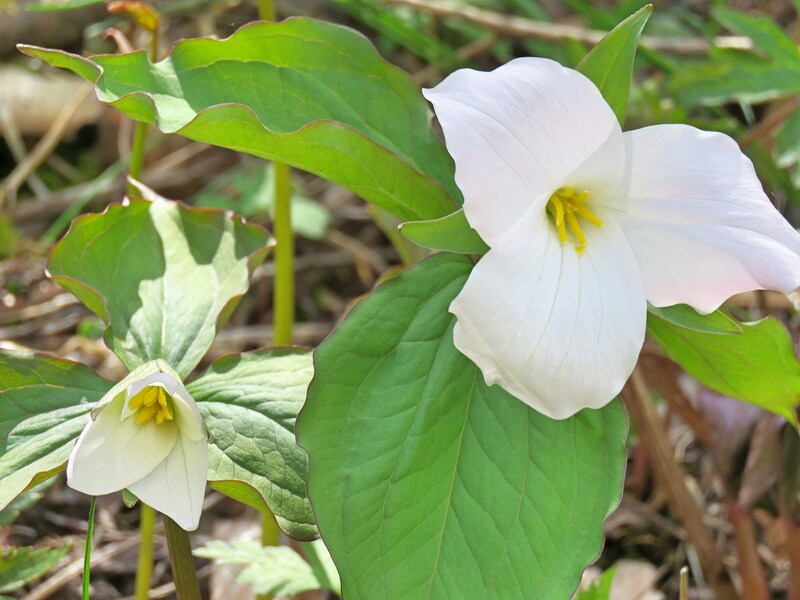 Trillium species, such as the great white trillium (Trillium grandiflorum) are being outcompeted by garlic mustard as a result of disturbance by white-tailed deer. Photo taken by Betty Truax. This is the part of the blog post where we address the title. Why did the good guys go bad? White-tailed deer are native and in appropriate numbers are actually very beneficial to our ecosystems. The problem lies in the currently unnaturally large population size of white-tailed deer in the United States. In Virginia, grey wolves have been absent for more than a hundred years, and coyotes do not frequent developed areas where deer are quite comfortable. Furthermore, forest fragmentation has provided far more suitable habitat for the fringe-loving white-tailed deer than ever before. Together, the decrease in predators and increase in habitat has caused deer populations in Virginia to skyrocket from under 30,000 in the 1930s to roughly one million individuals in 2017. That’s one million hungry mouths munching away at our native flora, and acres of new open ground that invasive species are just itching to colonize. Perhaps as white-tailed deer populations are more effectively maintained, the problems they cause will diminish. A large part of the invasive species problem is the alteration of ecological systems. Systems that have evolved together for millennia are now changing drastically and quickly due to anthropogenic causes. The more we learn about invasive species, the more we realize how one or two important aspects of an environment, be it light, nutrients, or herbivory, can drastically alter an invasive plant’s chances at taking root and dominating a habitat. As we attempt to protect our native flora, we must consider the unexpected consequences of our actions (in this case, the cascading effects of developing and hunting that have resulted in the overpopulation of deer, the decrease in our native flora, and the increase of invasive exotic species) and how we may me impacting the environment in grandiose and unexpected ways. Teasing out the interactions between environmental and biotic factors is the main goal for many ecologists, because the more we learn, the more we can work together to prevent the spread of nasty invaders and maintain the wealth of the native flora that Virginia has to offer!